Nicholas E. Bittner is an associate in the firm’s workers’ compensation department and was admitted to practice law in Delaware in 2016. He graduated from Bucks County Community College with an A.A. in Police Administration in 2011, Temple University with a B.A. in Criminal Justice in 2013, and obtained his J.D. from Villanova University School of Law in 2016. 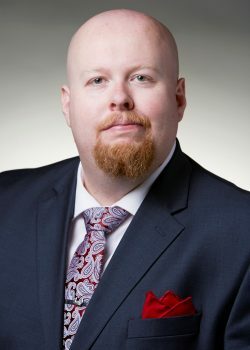 Mr. Bittner has an extensive background in investigation and litigation, owing from a work and educational history of private security and criminal justice, including two years of experience in criminal defense and nearly two years of experience working in the New Castle County Court of Common Pleas. In law school, Mr. Bittner served on the Honor Board for three years, was published in the Jeffrey S. Moorad Sports Law Journal, and served as an editor on the Sports Law Journal. Mr. Bittner is also an accomplished guitarist, a stand-up comedian, and the author of two books on philosophy. He has no children, but he does have a twenty-pound cat named Loki.